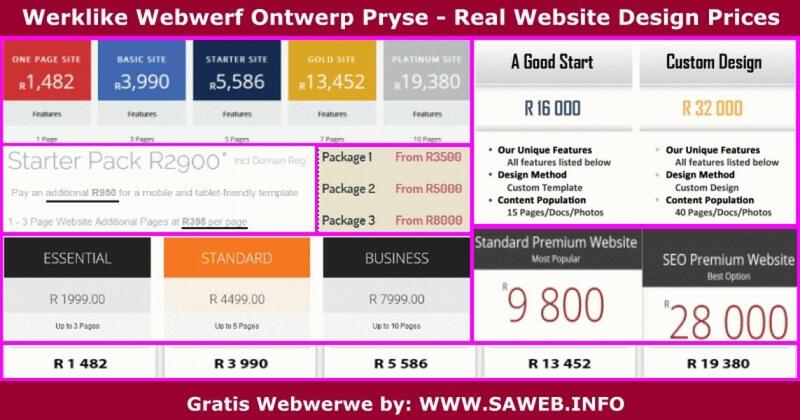 There are many different things which have an influence but a few are explained below to give you an idea as to why we can offer a website at R19 pm while other businesses ask up to R32 000. - The specific features are usually also a money making trick because there are hundred thousands FREE Programmes and scripts available to do a multitude of things, and the odds are 99.5% that they used that it don't justify the expensive prices for things such as forms, e-commerce and other automation and functions. - A specific business asking R5995 for an ecommerce system but guess what. They use an ecommerce system that you can install for free and the R5995 is for layout (looks) of the frontend while you can change yourself or buy a template for R300 that looks just so professionally and with EXACTLY THE SAME functionality. - In conclusion is the amount someone paid for a website total irrelevant as far as that success is concerned because it's CONTENT that is the most important. A free website with tons of good articles and content is 100x better than a R30 000 website without proper content. Just look how simple and plain look the sites of the Internet giants like Google or Twitter or Instagram or YouTube.